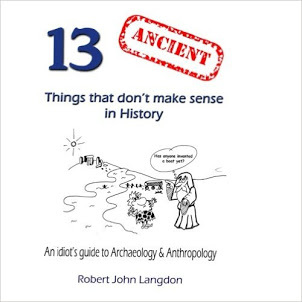 13 Ancient things that don't make sense in History: 13. 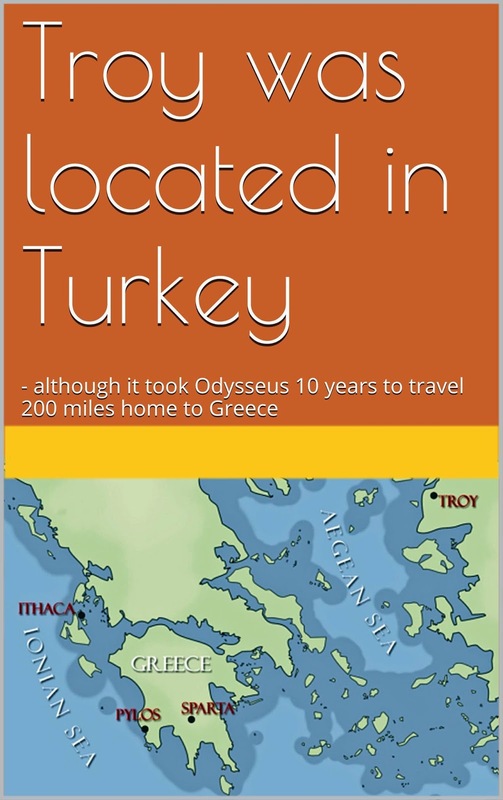 Was Troy really located in Turkey - if so why did it take Odysseus ten years to travel 200 miles get home to Greece. Where Troy Once Stood is a book by Iman Wilkens, that argues that the city of Troy was located in England and the Trojan War was fought between groups of Celts. The standard view is that Troy is located near the Dardanelles in Turkey. Wilkens claims that Homer’s Iliad and Odyssey, though products of ancient Greek culture, is originally orally transmitted epic poems from Western Europe. Wilkens disagrees with conventional ideas about the historicity of the Iliad and the location and participants of the Trojan War. Copies of his book ranked high on Bookfinder’s list of most-wanted out of print books until 2005, when the latest revised edition was published. His work has had little impact on professional scholars. Anthony Snodgrass, Emeritus Professor of Classical Archaeology at Cambridge University, has named Wilkens as an example of an “infinitely less-serious” writer. So what evidence does Wilkens use to prove that Troy was in Northern Europe? Wilkens argues that Troy was located in England on the Gog Magog Downs in Cambridgeshire. He believes that Celts living there were attacked around 1200 BC by fellow Celts from the continent to battle over access to the tin mines in Cornwall as tin was a very important component for the production of bronze. Wilkens writes that there are similarities between the river names in the Iliad and present-day England: “Homer names no less than fourteen rivers in the region of Troy.” The rivers Thames, Cam, Great Ouse and Little Ouse, to name a few, can respectively be identified as Temese, Scamander, Simois and Satniois, according to Wilkens. The revised edition of 2005 contains a “reconstruction” of the Trojan battlefield in Cambridgeshire. Wilkens further hypothesises that the Sea Peoples found in the Late Bronze Age Mediterranean were Celts, who settled in Greece and the Aegean Islands as the Achaeans and Pelasgians. They named new cities after the places they had come from, (similar to the migration of many place names to North America), and brought the oral poems that formed the basis of the Iliad and the Odyssey with them from Western Europe. Wilkens writes that, after being orally transmitted for about four centuries, the poems were translated and written down in Greek around 750 BC. The Greeks, who had forgotten about the origins of the poems, located the stories in the Mediterranean, where many Homeric place names could be found, but the poems’ descriptions of towns, islands, sailing directions and distances were not altered to fit the reality of the Greek setting. He also writes that “It also appears that Homer’s Greek contains a large number of loan words from western European languages, more often from Dutch rather than English, French or German.” These languages are considered by linguists to have not existed until around 1000 years after Homer. Wilkens argues that the Atlantic Ocean was the theatre for the Odyssey instead of the Mediterranean. 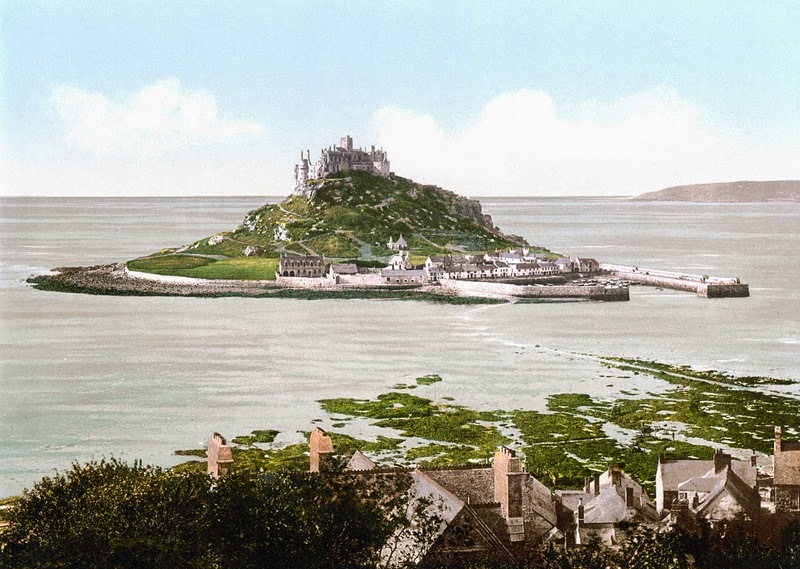 For example he locates Scylla and Charybdis at present day St Michael’s Mount. St Michaels Mount - site of Scylla and Charybdis? To prove his theory Wilkens produces archaeological evidence, for instance, the Isleham Hoard in the battlefield, and etymological evidence, for instance, the location of Ismaros in Brittany at Ys or the location of Homer’s Sidon at Medina Sidonia in Spain. He also brings forth indications that Homer described locations around the Atlantic, with distinctive topographical features. Cádiz would match the description of Ithaca; "There is in the land of Ithaca a certain harbour of Phorcys, the old man of the sea, and at its mouth two projecting headlands sheer to seaward, but sloping down on the side toward the harbour... "
Wilkens believes that Havana’s topography greatly resembles the description of Telepylos: The harbour, about which on both sides, a sheer cliff runs continuously, and projecting headlands opposite to one another stretch out at the mouth, and the entrance is narrow, "..., and the ships were moored within the hollow harbour, for therein no wave ever swelled, great or small, but all about was a bright calm...... "
Wilkens mentions several sources for his ideas. Belgian lawyer Théophile Cailleux wrote that Odysseus sailed the Atlantic Ocean, starting from Troy, which was situated near the Wash in England (1879). Charles-Joseph de Grave thought that the historical and mythological background of Homer’s work should be sought in Western Europe (1806). However, this is not the only source that shows the story could be of a different origin. The late Sir Moses Finley, Professor of Ancient History at University of Cambridge, concluded that ‘we are confronted with this paradox and that the more we know; the ‘worse off, we are’ and he, therefore, suggested that ‘Homer’s Trojan War must be evicted from the history of the Greek Bronze Age’. As it seems difficult to disagree with his conclusion, we are, in my view, left with only two options: the great Trojan War never took place in northwest Turkey and consequently; the Iliad is the fruit of pure imagination, or else; the war did take place, but in another country. And other facts show that the story may not be as straightforward as we once imagined for when we look at Northern Europe for signs of Troy, we get some interesting facts such as an old legend that Britain was founded by Brutus who led survivors from Troy here. Geoffrey of Monmouth wrote in his Historia Regum Britanniae an origin myth which traced the foundation of Britain back to the Trojans. This account described how Brutus, great-grandson of Aeneas of Troy, landed at Totnes, subdued the race of giants who lived there, and gave his name to the country he had pacified (Britain = Brutus). 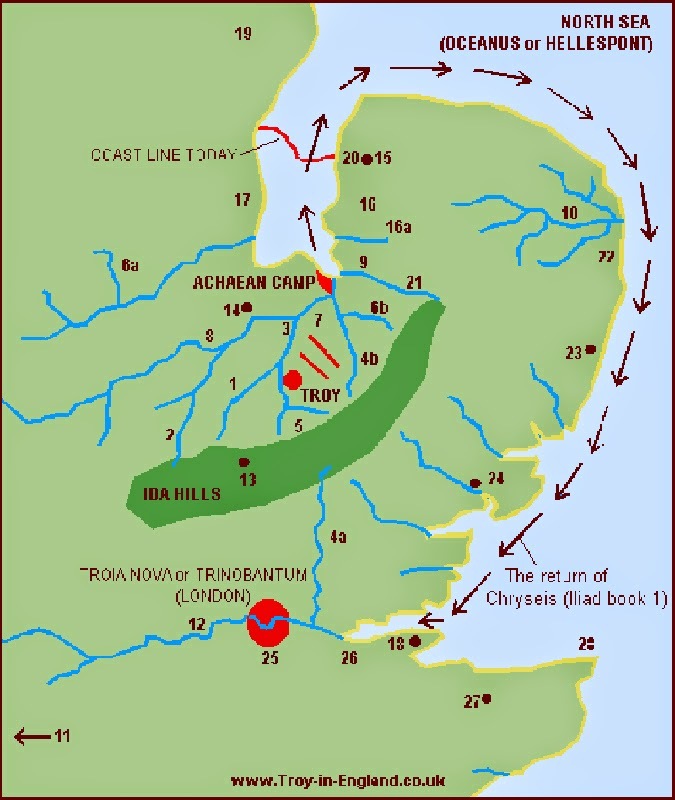 The Romans called the Celtic tribe that occupied this part of Essex the Trinovantes or “Tri-novante” which means New Troy or Troy of New. The Baltic Origins of Homer’s Epic Tales is an essay written by Felice Vinci, a nuclear engineer and amateur historian, published for the first time in 1995. The book, translated into several languages, submits a revolutionary idea about the geographical setting of the Iliad and Odyssey. Felice Vinci started reading Greek classics and learned about a passage from the De facie quae in orbe lunae apparet, by Plutarch, which points out the location of Ogygia. This island became the point of departure of Vinci’s theory. According to his assumptions, the events told by Homer did not take place in the Mediterranean area, as the tradition asserts, but rather in the seas of Northern Europe, Baltic Sea and Northern Atlantic. This theory has been widely taken into consideration (both in Italy, where the author has been invited to present it at some universities and high schools and the rest of the world) and has caused heated debate among the academic community. According to Vinci, the Achaeans would have lived at the beginning of the 2nd millennium BC on the coasts of the Baltic Sea and, towards the middle of the millennium, since the climate had become harder, they would have moved southward along the Dnepr, reaching the Black Sea and the Aegean Sea. The newcomers would have founded the Mycenaean cities (the most ancient Mycenaean graves are rich in amber, a typical Baltic product, whereas the latest ones are not) and would have named them with the names of their previous settlements in Scandinavia, although not exactly in correspondence of their location, because of the physical differences between the two areas. During their migration, they would have brought with themselves their traditional oral tales, which were poetic sagas set in their original homeland. Therefore, the Trojan War would not have taken place around the 13th century BC, as it is normally thought, but around the 18th century BC. Then the poems would have been transcribed later, after 800 or 900 years of oral tradition. In support of the theory, it is important to remember that the Mycenaean’s are not considered an aboriginal population, but are thought instead to have come to Greece around the 16th century BC. Felice Vinci also reports the hypothesis formulated in the late 19th century by the Indian expert Bal Gangadhar Tilak, according to whom Indo-European populations would have lived around the Arctic Circle in the past. On the other hand, the so-called ‘Linear B’ documents appear to have been written in a language which was a precursor of what later became Greek. The main topic of Vinci’s hypothesis is the incongruence between the geography described by Homer and the conformation of the Mediterranean lands, already noticed by Strabo. The geographical descriptions provided by the Iliad and the Odyssey, on the contrary, perfectly adapts itself to Northern Europe, and the incongruity regarding the Mediterranean localities would be due to the subjective application of the old Scandinavian names. Furthermore, the description Homer gives of climate would be more suitable for the Baltic regions. According to Vinci, Ulysses’ journey would have taken place along the coasts of Norway. After being held back in Ogygia (identified with one of the Faroe Islands, following Plutarch’s passage mentioned above), the Odyssey relates that, after seventeen days on the sea, Ulysses reached Scheria, home of the Phaiakians, described as a high rocky coast and densely wooded: this region, impossible to locate in the Mediterranean area, could be instead identified with the environs of Bergen, at the mouth of river Figgjo, where several Bronze Age objects have been founded (Scheria is never mentioned in the Odyssey as an island). The new position would explain why Ulysses had noticed that the sea used to flow back into the river: this phenomenon is due to ocean tides and does not occur in the Mediterranean. Other places visited by Ulysses could be located on the Norwegian coasts, too: Circe’s island, Aeaea, and the places she describes (the Sirens, Scylla and Charybdis) may be placed in the Lofoten archipelago, where tides on the ebb create the so-called maelstrom, corresponding with the Scylla whirlpool which swallowed up Ulysses’ ship and is described as forming three times a day, just like the maelstrom. In the end, Aeolus’s island would be located somewhere in the Shetland archipelago, where winds exceeding 200 km/h often blow. Other Greek mythological tales are set in the same region. Among these, the Argonauts’ journey, who are said to have reached Colchis sailing eastwards and arriving then at Aeaea, from where they came back to Greece going westwards. The identification of Colchis in the Black Sea and of Aeaea in the Tyrrhenian Sea would force to hypothesize for the Argonauts an improbable itinerary by ship in Continental Europe, along the rivers the Danube, Po and Rhone. The navigation would be instead the memory of an ancient counter-clockwise circumnavigation of Scandinavia starting from the Baltic Sea, crossing Lapponia overland along the rivers which run through it and reaching Lofoten, where Aeaea was identified. According to what Circe tells Ulysses, Argonauts chose for their journey home the course passing through the Wanderers Rocks, which are to be identified with the narrow straits covered by the streams between the islands and the mainland. Another reference to an ancient Nordic setting can be found, according to Vinci, in an assertion by Plato in his dialogue Critias, where the philosopher reminds him that Athens used to rise formerly in a flat fertile zone, not harsh and mountainous: this particular is presented in the book as a reference to the ancient Baltic Athens. So how is it possible that Troy was in Northern Europe? The climate described by Homer is cold and stormy: mist and the wind often appear, and storms are heavy. The characters are often covered with thick cloaks and are never described as sweating because of the heat. Although in the period normally chosen to date the Trojan War (8th century BC) the average temperature was lower than it is nowadays, the Homeric weather conditions are difficult to adapt to the Aegean area, especially considering that the events are likely to have happened in summer, instead, this description would be perfect for the Prehistoric Baltic regions when temperatures in Northern Europe were by far higher than now: the drop in temperatures at a later time would have forced Achaeans to migrate southwards. Some passages of Iliad’s and Odysseys can be interpreted as a description of typical Nordic phenomena. For example, in the great battle between Achaeans and Trojans, linchpin of Iliad’s central books, the time of noon is quoted at two different moments; this wouldn’t be a mistake: the battle would have simply continued for two consecutive days, thanks to the midnight sun, which let the warriors carry on fighting. Other references to this phenomenon are the exceptional duration of the day among the Laestrygonians and Ulysses’ uncertainty when trying to find his way to Aeaea since he cannot figure out where the sun rises and where it sets. Moreover, the Greek aoidos would be similar to the Old Norse skald, as Homer would often make use of a figure of speech known as 'kenning' in Nordic literature. Also, some mythological figures would be similar in the two cultures (for example, Ulysses to the archer Ull in an Icelandic saga and Hamlet, main character of an ancient Danish legend reported in Saxo Grammaticus’ Gesta Danorum), as well as many divinities: Aphrodite corresponds with Freyja, Ares with Thor, Zeus with Wotan and the Keres (who come down on the battlefield to take the souls of dead warriors, with the Valkyries). 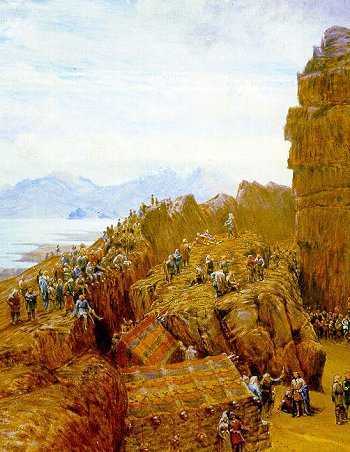 • The Achaeans built 1186 ships for their attack on Troy; they could have travelled the short-distance overland far quicker and cheaper if Troy really had been in the Turkish setting. • Odysseus claimed to have got home by travelling as a passenger on a ship going from Crete to Sidon (present day Saïda in Lebanon), but that is the opposite direction he needed to go in the Mediterranean setting. • Agamemnon tells us it took him a full month to sail from his kingdom Argos to Ithaca; we know the trip takes less than 24 hours in the Mediterranean setting. • The mythical location for Troy in Turkey is far too small to accommodate the invading army of about 100,000 men and the long pursuits in horse-drawn chariots. • The extensively travelled Greek geographer Strabo who lived 2000 years ago (1200 years after the Trojan War) believed that some of the ports of call in the Odyssey should be found in the Atlantic because of the mention of tides that do not exist in the Mediterranean. So Troy was not in the Mediterranean - but was it in Britain or somewhere even more revolutionary? Plato’s student, Aristotle, believed that ancient Troy and Atlantis were somehow connected. One of Aristotle’s students, Theophrastus (circa 330 B.C. ), wrote that the Atlantis story was factual, as did the Syrian philosopher Poseidonios (circa 90 B.C.). Strabo, a Greek historian writing in about 20 B.C., wrote a lengthy comparison between Troy and Atlantis’ geographical descriptions. 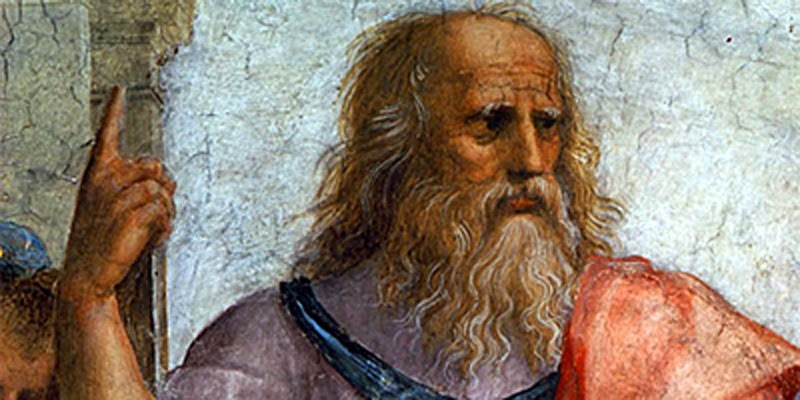 Plato has always been seen as the source of creditable information for he is not a ‘story teller’ like some other historical writers, he is fundamentally a philosopher, whose writings are still studied even now, some 2,000 years after his death at the most famous and prestigious universities throughout the world. This man is not prone to fantasy or exaggeration, his writings. Therefore, must be accepted as true evidence that once in the distant past an great ancient civilisation, did, in fact, exist, and that they changed the course of humanity in ways which I believe we do not fully understand to date. Consequently, we need to look at the probability that Plato’s ‘Atlantis’ is a genuine reference to this land, as it is the oldest written source and may give us clues of how this civilisation lived and traded. Fortunately, for us, Plato gave some detail about this civilisation, such as how they lived and what they believed, which will allow us to compare what we know; from the landscape and archaeological finds and looked for other areas of investigation the texts might reveal. Plato’s most famous line from ‘Timaeus’, a dialogue between Critias and Socrates, where ‘Critias’ tells a story, he learned through his family, about the Greek statesman ‘Solon’, whilst he was studying with the most scholarly of Egyptian priests during a visit to Sais in Egypt in about 590BC. 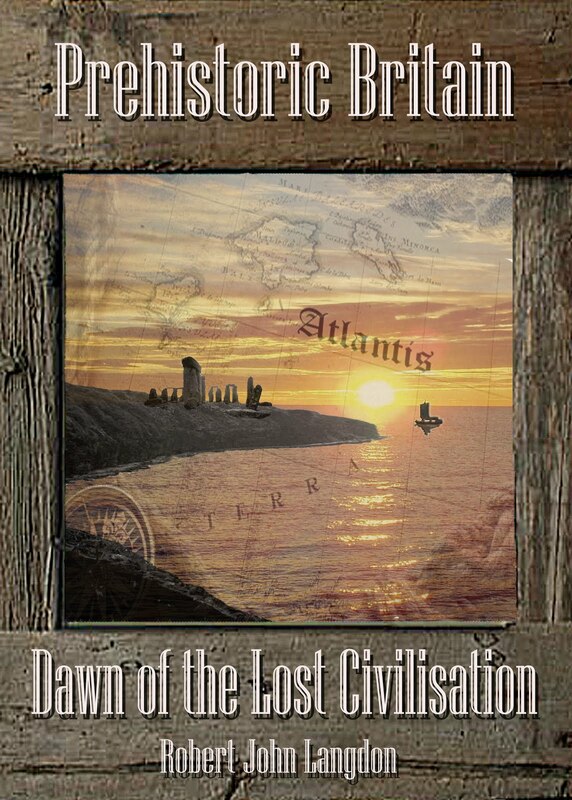 The priests claimed to have access to secret records about a lost civilisation called ‘Atlantis,' which only they were allowed to read, for it was written on the pillars within their most sacred temple. Now Sais was one of the oldest cities in the old kingdom, and the city’s patron goddess was ‘Neith’, whose cult is attested as early as the 1st Dynasty, ca. 3100- 3050 BCE. The Greeks, such as Herodotus, Plato and Diodorus Siculus, identified her with Athena and hence postulated a primordial link to Athens. Diodorus recounts that Athena built Sais ‘before’ the ‘deluge’ that supposedly destroyed Athens and Atlantis. While all Greek cities were destroyed during that cataclysm, the Egyptian cities, including Sais survived. As we can see from this connection, the deluge has incredible importance to ancient civilisations, clearly indicating that any prehistoric civilisation that wanted to ‘stay alive’ would possibly build boats, not for some, but for everyone. Sadly, the city of Sais has been recently destroyed by farmers who used the house and temple mud bricks, as free fertiliser for the fields – to this date, the temple and its writings have never been found. The most famous line from Plato’s dialogue is “in front of the mouth which you Greeks say ‘the pillars of Hercules’ there lay an island which is much larger than Libya and Asia together” translated by W.R.M. Lamb 1925 or “in front of the straits which are by you called the Pillars of Hercules; the island was bigger than Libya and Asia together” B. Jowett 1871. According to some Roman sources, while on his way to the island of ‘Erytheia’ Hercules had to cross the mountain that was once Atlas (the Atlas Mountains are in Northern Africa overlooking the Mediterranean), instead of climbing the great mountain, Hercules used his superhuman strength to smash through it. By doing so, he connected the Atlantic Ocean to the Mediterranean Sea and formed the Straits of Gibraltar. However, the best evidence is in the name itself ‘Atlantis’ for Herodotus (an ancient Greek historian, 484 BC – c. 425 BC) in a time before Plato’s writings calls the Sea outside the Pillars of Hercules the ‘Atlantis Sea’ (Cyrus, 557-530 BC: Book 1). Moreover, even today we call it the Atlantic Ocean and in history C’s and S’s are commonly transposed. So we left with a clear understanding that Atlantis was in the Atlantic Ocean, but then come the next problem with this description “the island was bigger than Libya and Asia together” this is where most Atlantis claims fall flat. Libya was well-known in Plato’s time as a big country as it bordered the Mediterranean, but the reference to Asia cannot be the Asia we know as it was unknown to the old world and the Greeks. Therefore, the Asia that Plato was referring to, is now called Asia Minor. The size of this ‘island’ is consequently, a major problem for historians to date, as the only two island possibility is the Caribbean in America or a continent that was once in the middle of the Atlantic Ocean that has disappeared without a trace. Well, the islands of the Caribbean are far too small and the trek across the middle of the Atlantic Ocean without landmass to guide the ships eleven thousand years ago quite daunt to be truly feasible with ‘Bronze Age technology’ as Plato suggests. This is why the search has failed, to date, and all various ‘silly’ hypotheses based on the Mediterranean make news headlines. If we look again at this passage and the exact wording of Atlantis, we find something most researchers have overlooked in the translation, and it’s the word ‘island,' the original Greek word is ‘nesos’ which can mean either island or peninsula. If we are looking for a ‘Peninsula’ (which is a piece of land that is bordered by water on three sides but connected to the mainland.) that is outside the Mediterranean, then there are only two possibilities - Africa or Europe. These are both outside the Pillars of Hercules and can be easily navigated by sticking to the shorelines. The African continent as shown no signs of any peninsula on its Atlantic side that has disappeared in the past 10,000 years - but Europe has! 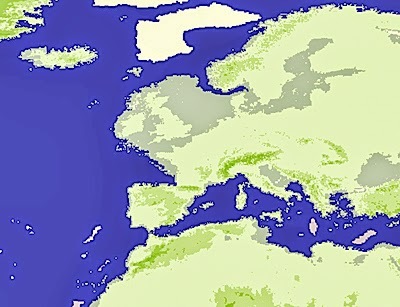 If we look at a map of Europe at the end of the Ice Age, we notice that the water levels were about 160m lower than today, so much lower that extra coastlines are added to both Spain and France. However, when we look at the British Isles, we notice Britain has completely vanished. The Britain Isles has replaced a massive new landmass protruding into the Atlantic Ocean, for the English Channel, Irish Sea and the North Sea as we know it a single land mass, has replaced today. Moreover, the waters to the west of Ireland and North West from Scotland have also been reclaimed from the sea. This peninsula which includes to the North East Norway, Sweden and Finland, to the east Denmark and the Baltic Sea, creates a continent about the same size of Libya and Asia Minor, which correlates to Plato’s writings. We know from our history that the rising of sea waters over the last 10,000 years the caused flooding that created the island nation we know today. But, do the writings contain any other information, which will allow us to confirm this peninsula is the land mass Critias is talking about? Plato adds, “yonder (beyond the pillars of Hercules) is a real Ocean, and the land surrounding it may most rightly be called, in the fullest and truest sense, a continent” in this sentence the ‘island’ is turned into a ‘continent’ so this proves that the translation of ‘nesos’ is peninsula not island and in today’s terms, we are looking at a land mass that incorporates British Isles, Scandinavia and the Northern European countries of France, Germany, Holland, Belgium, Poland, Netherlands, Denmark, Lithuania, Latvia, Estonia and the Baltic, North and Irish seas, that were at time land masses. So if Atlantis was in the North Sea where ‘Doggerland’ used to exist, was Troy the name of its main city on this Island/Peninsula as suggested by Aristotle’s school? 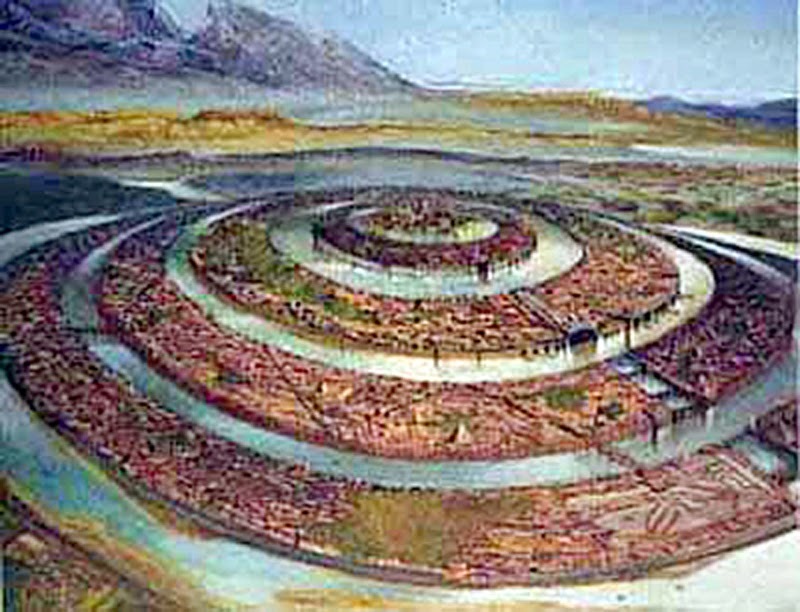 Plato wrote of a city of five stades (925m) diameter that was surrounded by several circular structures - concentric rings - some consisting of Earth and the others of water. These types of constructions are found all over Northern Europe, and I believe to be the ‘architectural blueprint’ for this society. A causewayed enclosure is a type of large prehistoric earthwork common to the early Neolithic in Europe. More than 100 examples are recorded in France and 70 in England, while further sites are known in Scandinavia, Belgium, Germany, Italy, Ireland and Slovakia. The term “causewayed enclosure” is now preferred to the older term causewayed camp as it has been demonstrated that the sites did not necessarily serve as occupation sites. 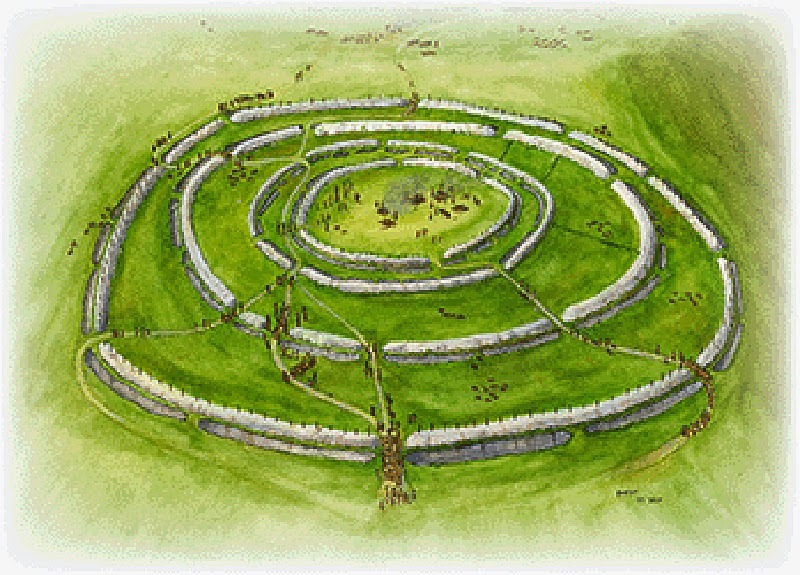 Causewayed enclosures are often located on hilltop sites, encircled by one to four concentric ditches with an internal bank. In general, enclosures located in lowland areas are larger than hilltop ones. Crossing the ditches at intervals are causeways, which give the monuments their names. It appears that the ditches were excavated in sections, leaving the wide causeways intact in between. They should not be confused with segmented, or causewayed ring ditches, which are smaller and are thought to relate only to funerary activity, or with hill forts, which appeared later and had a definite defensive function. Concerning defensive functionality, however, evidence of timber Palisades has been found at some sites such as Hambledon Hill. If we look at one of these ‘sites’ such as ‘whitehawk’ on the South Downs near my house, we find the description sounds remarkably like Plato’s description of Atlantis’s main city. Whitehawk Camp is one of the earliest sites of human habitation in England. It is the remains of a Neolithic causewayed camp inhabited sometime around 2700 BCE and is a scheduled ancient monument. 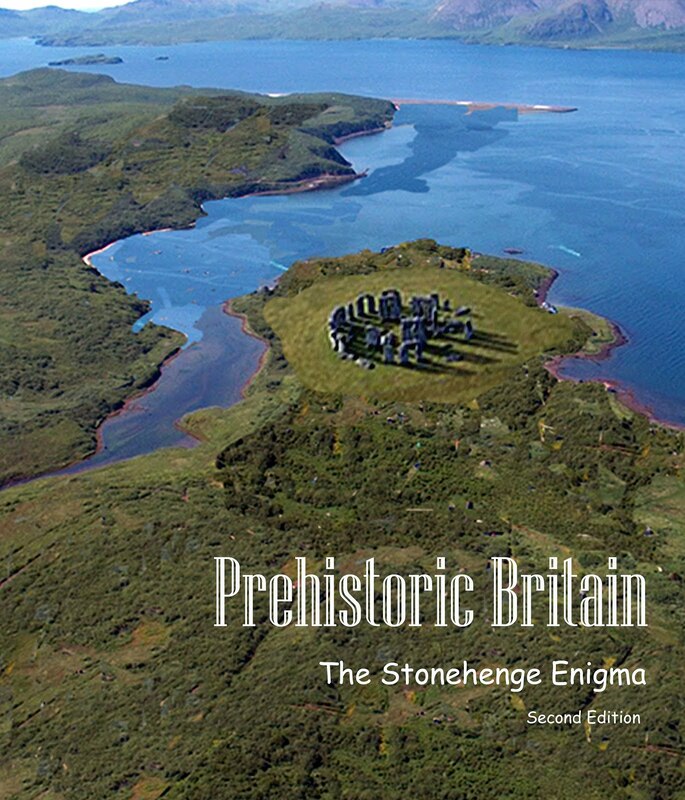 It has been described as one of the first monuments in England to be identified as being of national importance, and one of the most important Neolithic sites in the country. How the archaeologists see Whitehawk - with DRY ditches? It is one of only twelve remaining examples of a causewayed hill camp from the Windmill Hill culture in Britain and one of three known to have existed in the South Downs. It reaches 396 feet above sea level and measures 950 feet by 700 feet. It is made up of four concentric ditches broken up by causeways. The first written mention of the camp (as “White Hawke Hill”) was in 1587. 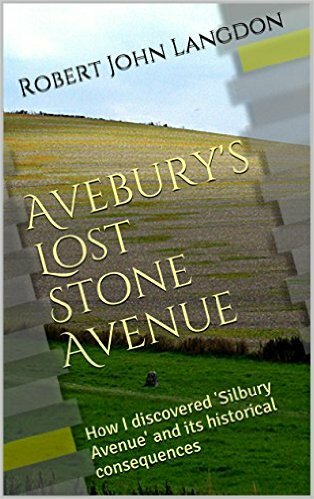 It was the first scheduled ancient monument in Sussex. It was excavated three times between 1929 and 1935. The 1932 excavation was carried out by Cecil Curwen, and found the remains of humans buried with fossilised sea urchins. The 1935 dig was a rescue dig by students of Mortimer Wheeler, when a road was driven through the camp. Much of the camp was, by that time, leveled under Brighton Racecourse and allotments. The remains of four complete burials were found, including the bodies of an eight-year-old child and a young woman buried alongside the remains of a newborn child, as well as some other human bones. Furthermore, found in the infill of the circular ditches were many flint tools, pot shards and animal bones. Only part of the causewayed enclosure has been investigated by archaeologists. Sadly, not much left after the racecourse ran through it! Many turf mazes in England were named Troy Town, Troy-town or variations on that theme (such as Troy, The City of Troy, Troy’s Walls, Troy’s Hoy, or The Walls of Troy) presumably because, in popular legend, the walls of the city of Troy were constructed in such a confusing and complex way that any enemy who entered them would be unable to find his way out. Welsh hilltop turf mazes (none of which now exist) were called “Caerdroia,” which can be translated as “ the City of Troy” (or perhaps “castle of turns”). W. H. Matthews, in his Mazes and Labyrinths (1922), gives the name as “Troy-town”. 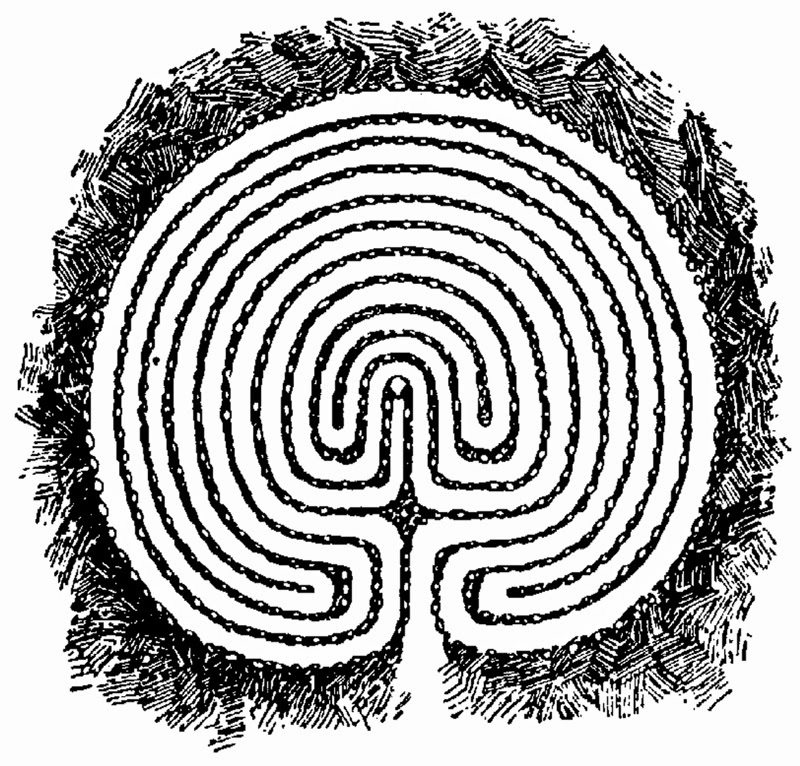 More recent writers (such as Adrian Fisher, in The Art of the Maze, 1990) prefer “Troy Town.” The name “Troy” has been associated with labyrinths from ancient times. An Etruscan terra cotta wine-jar from Tragliatella, Italy, shows a seven-ring labyrinth marked with the word TRUIA (which may refer to Troy). Of the eight surviving historical turf mazes in England, three have “Troy” names. “The City of Troy” is a small but well-maintained roadside maze near the small villages of Dalby, Brandsby, and Skewsby, not far from Sheriff Hutton in the Howardian Hills of North Yorkshire. “Troy,” a beautiful maze in a private garden at Troy Farm, Somerton, Oxfordshire is rather larger, and “Troy Town” maze on St Agnes, the Isles of Scilly, is a small maze of turf and small stones and is reputed to have been laid down in 1729 by the son of a local lighthouse keeper. All three follow the classical labyrinth pattern (as found on coins from ancient Knossos) rather than the medieval variation. Unfortunately, it is not known when the first two of these turf mazes were originally constructed. So we have evidence in the Iliad that the location of Troy was in a colder climate far away from Greek and through archaeological evidence, we see that towns like Troy, we built in the Northern Europe that still exist today. If this is not compelling evidence enough - there is more!! The Achaeans seem blond while the Trojans seem to have dark hair. The Achaeans (also called the “Argives” or “Danaans”) - A scholarly consensus has not yet been reached on the origin of the historic Achaeans about the Homeric Achaeans and is still hotly debated. Former emphasis on presumed race, such as John A. Scott’s article about the ‘blond locks’ of the Achaeans as compared to the dark locks of “Mediterranean” Poseidon. Achilles - The son of the military man Peleus and the sea-nymph Thetis. The most powerful warrior in The Iliad, Achilles commands the Myrmidons, soldiers from his homeland of Phthia in Greece. Proud and headstrong, was blond “and seized the son of Peleus by his yellow hair” (I:197). 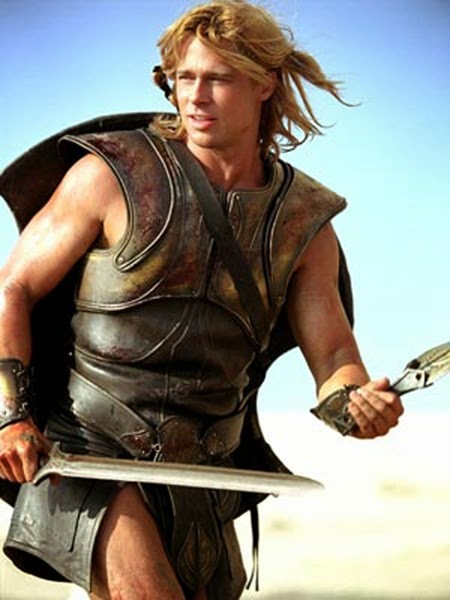 Brad Pitt - blond and blue-eyed just like most Greeks? 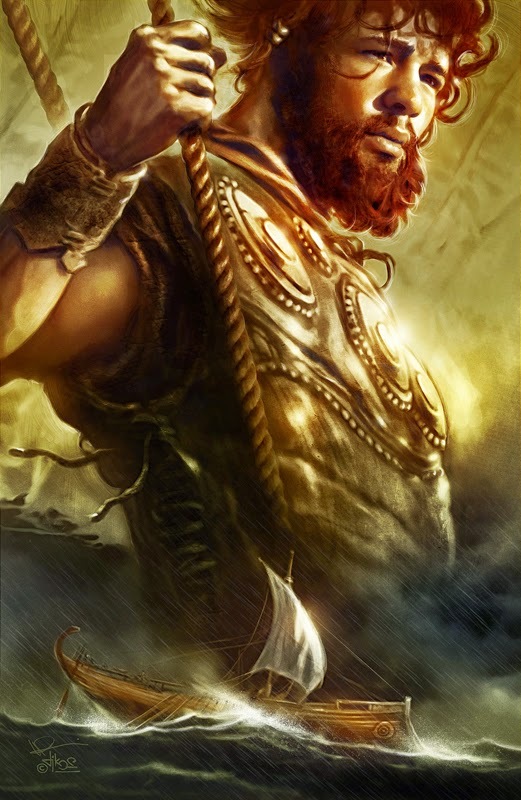 Odysseus - A fine warrior and the cleverest of the Achaean commanders. Along with Nestor, Odysseus is one of the Achaeans’ two best public speakers. The Odyssey describes him (VI, 231) as light-skinned, and in another place (XIII, 397, 431), his head-hair is called blond. According to hair colour, Odysseus is also described by the Odyssey (VI, 231; XVI, 175; XXIII, 157/58) as “brownish.” This “hyacinth colour” is, however, as Wilhelm Sieglin has shown, to be described as “reddish,” because the hyacinth was cultivated in Hellas as a sub-type with reddish blooms. Odysseus with his red hair - another Greek attribute? Menelaus - King of Sparta; the younger brother of Agamemnon. While it is the abduction of his wife, Helen, by the Trojan Prince Paris that sparks the Trojan War, Menelaus proves quieter, less imposing, and less arrogant than Agamemnon. Though he has a stout heart, Menelaus is not among the mightiest Achaean warriors. It was described as “the blond Menelaus” both in The Iliad (a minimum of fourteen times, III: 284, IV: 183, 210, X: 240, XI: 125; XVII: 6, 18, 113, 124, 578, 673, 684, XXIII: 293, 438) and The Odyssey. Peisander described him as “blond of big blue eyes. Idomeneus - King of Crete and a respected commander. Idomeneus leads a charge against the Trojans in Book 13; his hair was ‘flecked with grey’. Briseis - A war prize of Achilles. When Agamemnon is forced to return Chryseis to her father, he appropriates Briseis as compensation, sparking Achilles’ great rage. She is described as being very clever and beautiful with blonde hair, blue eyes and fair skin. Briseis - Blonde hair, Blue Eyes and Fair skinned, just part of your average Greek family? Meleager was a hero venerated in his temenos at Calydon in Aetolia. He was already famed as the host of the Calydonian boar hunt in the epic tradition that was reworked by Homerand is described as “the blond Meleager” by Homer (Iliad, II: 642), and in his Argonautica Apollonius of Rhodes also describes him as blond. Agamede was, according to Homer, a Greek physician acquainted with the healing powers of all the plants that grow upon the earth. She was born in Elis, the eldest daughter of Augeas, King of the Epeans. Hyginus makes her the mother of Belus, Actor, and Dictys, by Poseidon, and she becomes a sorceress figure, much like Circe or Medea. She has blonde hair and is familiar with all herbs Homer Iliad 11, 740-741. And lets us not forget how the ‘Gods and Heroes’ looked in Greek Mythology. Zeus - King of the gods and husband of Hera, Zeus claims neutrality in the mortals’ conflict and often tries to keep the other gods from participating in it. Although a description is not forthcoming from mythology, he was the father of both Helen and Athena both blue-eyed blondes, as his wife Hera was one of his three sisters - we can take it as read that they were all blued blondes. Hera - Queen of the gods and Zeus’s wife, Hera is a conniving, headstrong woman. 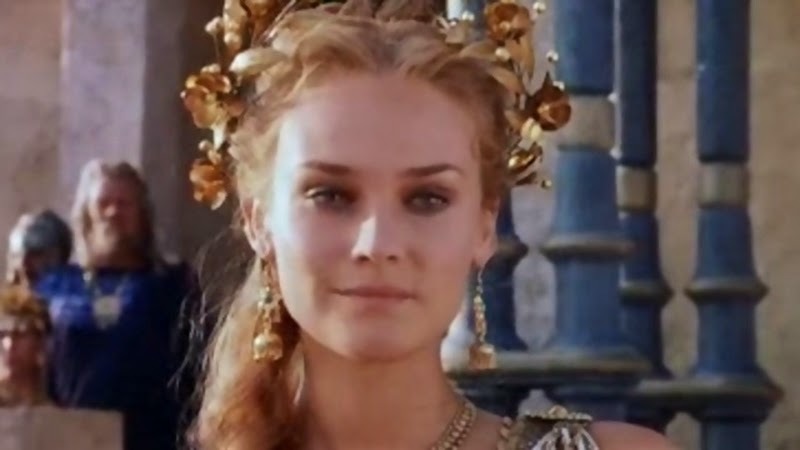 She often goes behind Zeus’s back in matters on which they disagree, working with Athena to crush the Trojans, whom she passionately hates - a blonde, mother of blue-eyed Helen and Athena. Athena - The Goddess of Wisdom, purposeful battle, and the womanly arts; Zeus’s daughter. Like Hera, Athena passionately hates the Trojans and often gives the Achaeans valuable aid - The Iliad describes Athena as blue-eyed, and in fact, refers to her fifty-seven times as Zeus’ blue-eyed daughter Athena. Apollo - A son of Zeus and twin brother of the goddess Artemis, Apollo is the god of the sun and the arts, particularly music. He supports the Trojans and often intervenes in the war on their behalf. Apollo is described by Alcaeus as “fair-haired Phoebus.” Phoebus is Apollo. 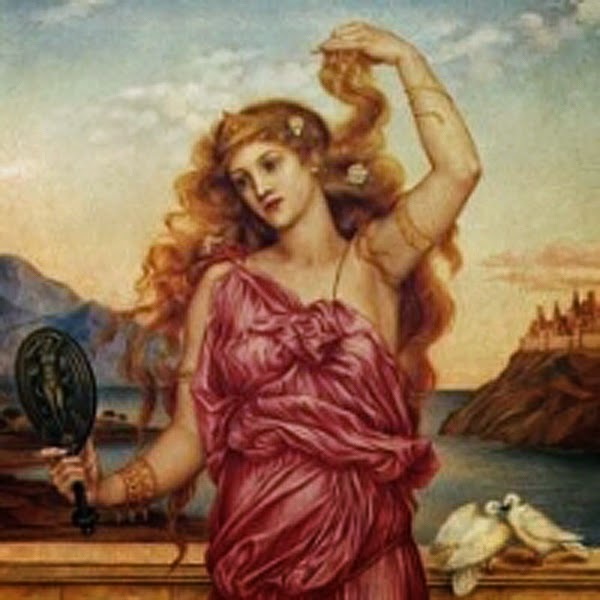 On the other hand, Alcman of Sparta, Simonides (paean to Delos, 84), and an anonymous author, call Apollo “of golden hair,” The famous Sappho of Lesbos speaks of “golden-haired Phoebus” in his hymn to Artemis. Athena - Long, dark curly hair and clear blue eyes. Artemis- Long, wavy brown-red hair and emerald eyes. Aphrodite - Long, white-blonde hair and sky-blue eyes. Ares - Very tall with short brown hair and amber eyes. Apollo - Blonde hair blue eyes. Dionysus - Long brown hair (about to ears) and hazel eyes. Demeter - Long brown hair and brown eyes. Hephaestus - Tangled dirty blonde hair and sage green eyes. Hera - Light brown hair and blue eyes. Hermes - Short, wavy blonde hair and blue eyes. Hestia - Irish red hair and blue eyes. Poseidon - Short, crew cut brown hair and sea colored eyes. 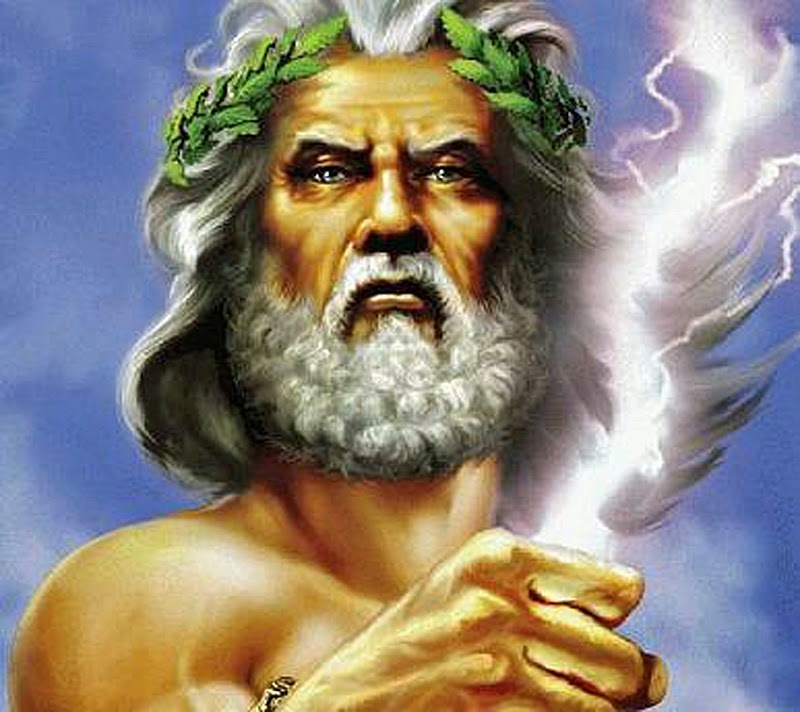 Zeus - Long (shoulder length) curly silver hair and sky-blue eyes. 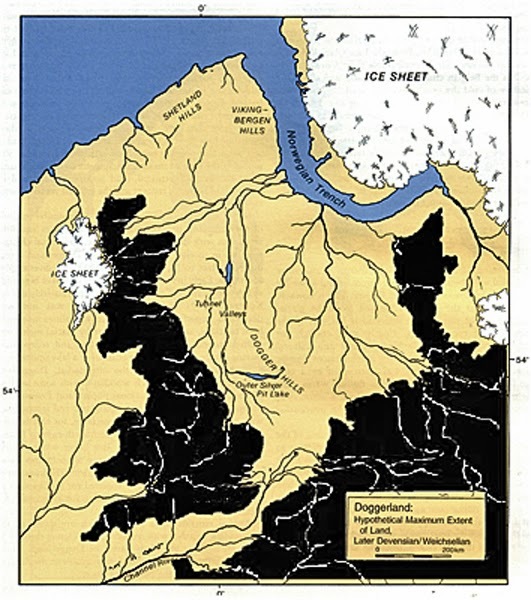 So the evidence is overwhelming that Troy was, in fact, not in the Mediterranean but the capital city of Atlantis and based in Northern Europe, probably on an island that we have geologically proven to have been engulfed by the time that Plato suggested in his works ‘Timaeus’ and ‘Critias’ in about 9000BC now called ‘Doggerland’. Who were the ancestors of the Scandinavian ‘blonde and blue-eyed’ discontents that live there today? But yet there is still one more intriguing piece of evidence from the tail of Troy that confirms our suspicions for the famous line “Is this the face that launched a thousand ships” was not only referring to the blonde blue-haired Helen of Troy’s daughter of the Blue-eyed God Zeus but also indicating that a nation in history had over a thousand ships, for to date no nation in history had that number of warships except one! Plato in his dialogues talks of the great advanced nation of Atlantis with its twelve hundred ships - surely the final piece of the Trojan jigsaw?